She-Knits: #44 One reason why. 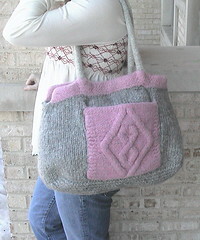 I Finally finished the two gigando Melly Bags and just love it in gray and pink. I keep trying to out grow my love for light pink, but alas at 50 I still lurve it! Here is the blog with the post about the variegated sweater I spoke about. 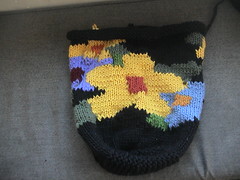 I finished the bag part of another customer Dream Floral and was stunned into horrified silence when I held it up and noticd that I had oriented it wrongly. I like most of the pattern to be on the front with a little wrapped around one side and a bit more wrapped around to the back on the other side. I did the whole thing wrapping one side. My LYS owner made the best suggestion when she said , rip and re-do the bottom. I cut off the bottom and picked up all the stitches and am going to make a mitered bottom. Hey, maybe after cutting off the bottom of this I will lose all fear of steeking! I don't care for varigated yarn and lace together unless the varigated yarn is very subtle and the lace pattern is very plain. Seriously...whats the point? Seems to me to show off lace at its best a solid or subtley hued yarn is in order. I also think a colorful yarn and cables don't make sense either I think in the end one need be very careful on multicolored yarn altogether. It can be stunning, such as Koigu creations (which I have never done) or hideous as witnessed below. Doesn't this look plain ugly? You're right. 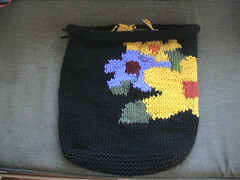 The varigated yarn hides the beauty of the large cable motif. 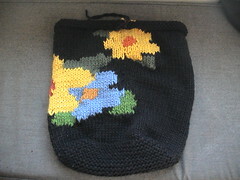 I tend to only use variegated yarns in plain stitch or ridging patterns. Still your other two bags look great. You still have the touch. I agree....lace & cables look best with one color and a yarn that shadows itself. But! Your work is always lovely! !